How do I know whether I have Hypertension or High Blood Pressure? How is Hypertension or High Blood Pressure usually treated? Can Herbal Remedies and Dietary Supplements really help? How have High-Rite and AquaRite helped others? How do I use High-Rite? Can I use High-Rite with my prescription blood pressure medication? Hypertension, or High Blood Pressure, can be defined as the force that the blood exerts on the veins and arteries while it circulates around the body. Blood pressure is controlled by a variety of organs and body systems, including the heart, the blood vessels, the kidneys, the brain and the adrenal glands, as well as the complex interaction between the body systems. We measure blood pressure by using two different numbers - systolic pressure (the top number) over diastolic pressure (the bottom number). Systolic pressure measures blood pressure as the heart contracts and pushes blood through the arteries. Diastolic pressure is taken when the heart relaxes. Normal blood pressure is around 120/80 or lower. It is important to note that blood pressure varies from person to person and can fluctuate from moment to moment. One or two high readings does not necessarily mean that you have hypertension or high blood pressure. If your blood pressure has measured 140/90 or higher on at least two separate occasions, your doctor should recommend a 24 hour BP (blood pressure) monitor, which will show whether your BP remains chronically high. This will help to measure whether you have hypertension or high blood pressure. Hypertension is sometimes known as the 'Silent Killer', because it often has no symptoms at all. Sometimes people with high blood pressure experience headaches or a ringing sound in their ears, but these symptoms may also be due to other causes. The best way to find out whether you have high blood pressure is to visit your doctor, homeopath, naturopath or other health care provider. Although the causes are not always known, high blood pressure can often run in families, indicating a strong genetic component. Risk factors for high blood pressure include smoking, alcohol abuse, obesity, a high salt intake, lack of exercise and stress - and a family history of hypertension and stroke. Arteriosclerosis, or a thickening, hardening and narrowing of the walls of the arteries is also often associated with high blood pressure. It is very important to take steps to control high blood pressure. If it is left untreated, it can result in heart disease or even stroke. The good news is that high blood pressure can be well controlled by combining a healthy lifestyle with the correct medical treatment. This can include synthetic prescription medication, natural remedies or a combination of both. If you are already taking prescription blood pressure medication, it is important to consult your doctor before making any changes. There are many different prescription drugs for high blood pressure including vasodilators, alpha-blockers, beta-blockers, diuretics, etc. Each has a different way of working and different drugs may work for different people. You may need to try a variety before you find the right drug or combination of drugs suitable for you. Like many synthetic drugs, anti-hypertensive medication has a risk of causing side effects, which depend on the person as well as the type of drug being taken. These can include, dizziness, nausea, stomach problems, fatigue, impotence, insomnia, loss of appetite and others. Always speak to your doctor if you are having problems. There are many well known natural remedies for high blood pressure or hypertension. Conventional medicines usually treat the symptoms of high blood pressure, but seldom address the underlying causes. Naturopaths recognise that high blood pressure may be a sign or symptom of imbalance in the body and know that the best way to treat it is by a combination of lifestyle changes and natural remedies to remove the causes of the high blood pressure, rather than simply treating the symptoms. Feelgood Health has developed two 100% herbal remedies to treat high blood pressure - High-Rite and AquaRite. High-Rite comes in capsule form and contains herbs which have been carefully selected to balance and regulate blood pressure and also to address some of the contributory factors which may be causing it. Each herb is in therapeutic dosage for maximum effect. There is a great deal of scientific evidence to suggest that the use of carefully chosen herbal remedies and dietary supplements can help to lower blood pressure, as well as to improve the overall functioning of the heart, arteries and the entire cardio-vascular system. What herbalists and traditional healers have known for centuries has now been clinically proven to be a potentially effective alternative to synthetic blood pressure medication, especially if combined with a healthy diet and regular exercise. High-Rite and AquaRite are two complex herbal remedies which can assist in the treatment and prevention of hypertension or high blood pressure. Like all Feelgood Health products, they are developed with care by our practising Clinical Psychologist, are 100% natural and are manufactured according to the highest pharmaceutical standards. Individual ingredients are well-researched and have been put to the test over the years as a complement to the treatment of real people with real problems. 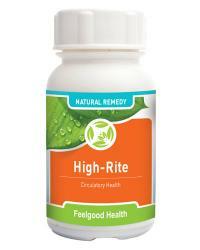 High-Rite is a 100% natural, non-addictive herbal remedy formulated by our team of natural health experts. High-Rite can be used to safely support health and systemic balance in the cardiovascular and circulatory systems. High-Rite contains a selection of herbs known for their supportive function to maintain blood pressure within the normal range and support the health of the heart, veins and arteries, encouraging routine oxygenation of the blood to the heart muscle and pulse regulation. "I developed high blood pressure during my menopause. My doctor recommended that I use prescription drugs but this has never been my style. He wasn't very pleased when I said I was going to research natural alternatives, but has had to eat his words because all his dire predictions did not come true! After my recent check up, he could not believe that my blood pressure was normal again! I can recommend these products without reservation." "I don't know what I would have done without HighRight to reduce my blood pressure, which runs in the family. I only wish that I had known about it sooner because it really works!" "I am only taking half the dose of my normal medicine after using your products for just 12 weeks. I hope that this will continue until I can stop altogether. My doctor has been very encouraging." Crataegus oxyacantha (Hawthorn) is one of the most highly respected natural remedies for high blood pressure and has well-known cardio-protective properties. Hawthorn works by dilating blood vessels, thereby increasing the heart's energy supply and improving its pumping ability and does this by blocking the action of a blood constricting enzyme called ACE (angiotensin-converting enzyme). Hawthorn therefore reduces blood pressure in cases where there are chronically constricted arteries. The anti-oxidant properties of hawthorn also help to protect against damage caused by plaque build up in the coronary arteries. Passiflora incarnata is a well known calmative herb which also relaxes blood vessels and reduces blood pressure. Viburnum opulus (Guelder Rose bark) is a very effective cardiac tonic and muscle relaxant. It is known to relax the cardiovascular system and also to relieve nervous tension, often associated with high blood pressure. Ginkgo biloba is one of the oldest trees on the planet, dating back about 200 million years. It has survived mainly in Oriental temple gardens, where it is highly prized for its medicinal properties in Chinese Traditional Medicine. Modern studies have demonstrated the significant effect that Ginkgo biloba has on the cardiovascular system, relaxing blood vessels, acting as a circulatory stimulant and anti-inflammatory. One of the most important active ingredients, ginkgolide, has been clinically shown to be just as effective as standard pharmaceutical drugs in treating irregular heart beats. Improving blood flow throughout the body, Ginkgo biloba can also reduce blood 'stickiness', which lowers the risk of blood clots. Directions: Take 2 capsules three times daily for the first 10 days, thereafter take 1 capsule twice daily as part of the ongoing program. May be combined with AquaRite for best results. Safety in pregnancy has not yet been established. Use only under medical supervision if you are also using prescription medication for hypertension. Because these herbs are very effective in controlling blood pressure levels, the dosage of your prescription drugs may need to be reduced or even stopped altogether. Yes, you can - but NOT without first consulting your doctor. These remedies are very effective in normalizing blood pressure and improving heart functioning. Your doctor should monitor your blood pressure regularly while you are taking our remedies as it is possible that your prescription medication may have to be reduced or even stopped altogether. If your doctor is not familiar with natural remedies or is unsympathetic towards your quest for a healthier alternative, seek a second opinion. NOTE: Do not stop using your prescription medication without first consulting your doctor. If I have high blood pressure but I am not on any prescription drugs, can I take High-Rite and Aquarite? Yes, of course! Using High-Rite and AquaRite, while following a healthy diet and lifestyle may completely normalize your blood pressure and remove the need for prescription drugs. If you have mild hypertension, these remedies can also prevent problems in the future by acting as cardiac and circulatory tonics. Results may vary, due to a number of influential factors. Over time (usually 3-6 weeks) High-Rite will act in a supportive capacity to a healthy cardiovascular and circulatory system, with some individuals responding sooner than others. Best results are achieved when High-Rite is used consistently and the recommendations regarding diet and consistent discipline are followed. One bottle of High-Rite will last between 10 days (higher recommended dose) and 30 days (lower recommended dose) depending on frequency of use and dosage. Exercise regularly. It has been shown that people who exercise regularly are less likely to develop heart problems. Eat plenty of fresh fruit and vegetables as well as low fat dairy products. Reduce fat and salt intake. If you are overweight, loose it! Even a few extra kilograms can increase the risk of high blood pressure. Avoid smoking and excessive alcohol use. Drink at least 8 glasses of water a day and take vitamin supplements containing Vit C, Vit D, Calcium and Magnesium. The Rite Combo: Support healthy fluids in the body and healthy blood pressure!